The Converse Blog: The Converse Blog's Friday Flashback: Chany He: Helium Skate Shoe. The Converse Blog's Friday Flashback: Chany He: Helium Skate Shoe. There has been all kinds of stuff going on the last few days. I've been emailed pics from the Open Gym in Philly, there is a new Converse contest with Eastbay, plus I am working on something new for the blog. However, all of that will have to wait, at least for today. Why? Because today is Friday, and Friday's are for Flashbacks. Today's Flashback is the Chaney He: These were the only Converse Helium skate shoes that were released, and they were signature shoes for Chany Jeanquenin. The first colorway, is the black/blue/grey colorway. These actually are in my collection, although I've never been a skateboard. As you can see in the heel area, Converse Helium provided the cushioning for these. 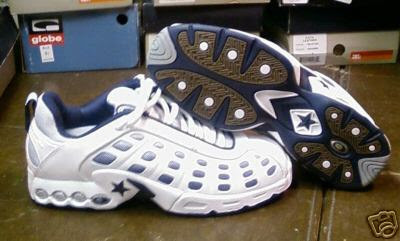 They also featured Converse ABS, which to best of my memory was a technology used make the materials more durable. This was applied to the cage looking material on the outer side of these shoes. Below are the two other colorways that were released. I am extremely jealous of anyone that has the White/Blue colorway. I always thought they looked the best. You can see the Helium logo on outsole of this shoe here. The logo is combination of C for Converse and He: for the periodic table's symbol for Helium. Before I sign off for today, I want to talk about Converse Helium. This is by far my favorite Converse technology. 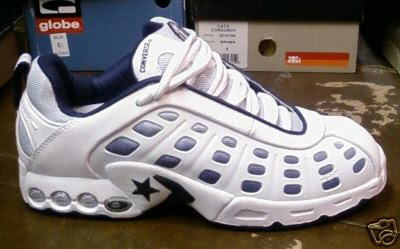 I still say to this day the best basketball shoe I've ever had was the Converse He:01. 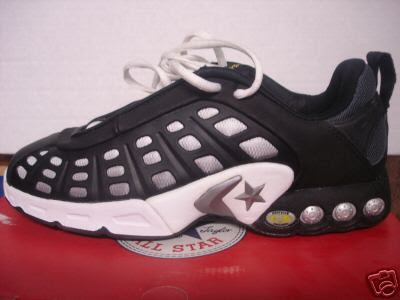 Converse Helium really came at a terrible time for Converse, in the 99-01 range in which the company fell into bankruptcy. To me, Converse Helium had the most potential to take Converse to the next level. At the time when Converse Helium was announced, Basketball, Training, Running, and Skate shoes were promised. I even went as far as to pre-order a pair of the running shoes from Hibbit's. However, the running shoes were all canceled except one pair. The training shoes never came out here in America and the skate team died out shortly after. Basketball was the only catagory to continue on the Helium line. 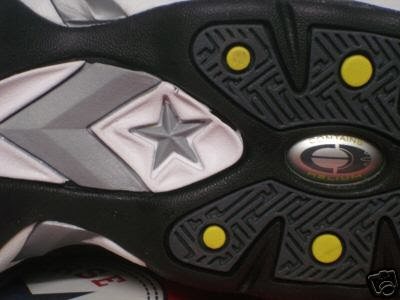 It was two years after the initial release before Helium found its way to a Converse team shoe. I've always wanted to see a full length Converse Helium shoe would look and perform. Hopefully someday Converse Helium will return. Until then, I'll have to live in the past, and in what could've been. Thanks for stopping in, please take a second to vote on the way out. I recently obtained a BRAND NEW pair of Converse All Star Helium shoes--Size 18! Any idea if there is a market for them? I'm thinking of listing them on ebay--any hints on what I should list as an asking price--these shoes have NEVER been worn! !